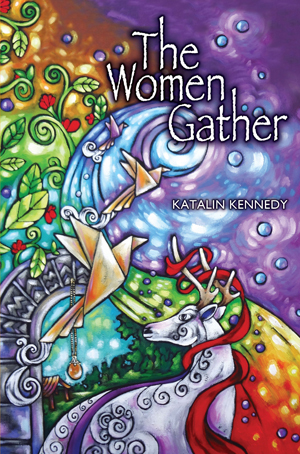 Joining us today is author Katalin Kennedy, author of THE WOMEN GATHER. Ms. Kennedy’s book is about a group of women who call themselves the Norean Order; it tells the beginning of the order and its hope for the future. Thank you, Katalin, for speaking with us. KK: It is indeed my pleasure. Thank you so much for agreeing to let me tell you about my first novel THE WOMEN GATHER. I am delighted that you had a chance to read it. KK: It is a story of women who see a higher calling for the future of humanity. It all begins in the late 1990s when a small group of women gather in cyberspace and chat about their hopes and wishes to alleviate the world from chaos, poverty and power-hungry aggression. Nora and her friend Sarah open a School for Women in a place called Lemuria and eventually establish The Norean Order. I was struck by the title of your book, THE WOMEN GATHER. It works on many different levels, doesn’t it? What is the significance of the title in terms of your novel? KK: The title THE WOMEN GATHER came to me almost immediately. Perhaps it came from my own experience. I have a fairly soft voice, and I have found that I was often dismissed while others took over the conversation. When speaking on behalf of a group, however, I came to realize that people took more notice and considered my point more significant. Yes, the term 'gather' has many meanings, most of which work within the novel. The term is woven through various aspects of the stories told in the novel: we hear about the first time the women met face to face which evolved into the establishment of the initial Sanctuary; they assembled as a group to gather information about women's role in history. So the term 'gather' and 'gathering' has various nuances. Because of the increasing number of women’s Sanctuaries and the knowledge they’ve accumulated over many years, women begin to accept their worth, speak out and make plans to present to the Outerworld. Gatherings of women, in the past as well as today, have often been marginalised. Do you see the title of your book as a way of reclaiming what society has traditionally ignored? KK: I think that fear on the part of mainstream has caused dismissal of women's organizations. When women's gatherings are large, we are mighty and maybe threatening to the status quo. Major women's organizations in Canada and elsewhere have placed significant issues on the political agenda (violence against women being just one of them). Some organizations struggled to survive, others were perhaps maligned. Sadly, significant issues continue to be with us, 15, 20 years later. I don't want to throw the blame onto society. Perhaps we have lost energy and momentum; I also think that every generation has to find its own voice. In my novel, it is Aideen who needs to consider what direction she will take. I would like to throw the torch to her. But then, the naive best part of me still feels that we (even at my age) can be heard by gathering together. In the novel, the Norean Order has cloistered itself in Sanctuaries. Women (past and present) are cloistered for any number of societal and religious reasons. While often seen as a patriarchal imposition, the Noreans see it as beneficial. What are your thoughts? KK: In the 'real' world, I'm not comfortable with cloistered groups. We only see these groups through the eyes of the media, which of course places its own spin on it. And we only hear about these cloistered groups when there has been some very negative issue raised. I don't consider polygamist groups as an answer to world harmony; I'm not convinced that the various monasteries in the western or the eastern religions are thriving. I believe that some do more than be simply cloistered; they provide service to the world around them. Mother Teresa founder of the Missionaries of Charity clearly is an example we can praise. As for the Norean Order, it represents my world of imagination. I cannot help but wonder how absolutely glorious it would be if all the kind, compassionate, caring, creative, intelligent women whom I know could live together and invent a new world order. I am a firm believer in consensus building - which perhaps is not part of the patriarchal agenda. In the end, the plan is to bring to the Outerworld an order rooted in communication and consensus building among all areas that would be affected by any issue. This of course is the supreme challenge which may only come to fruition in the imagination. The Noreans have cloistered themselves in order to study the lessons of the past. What can such an historical context provide when preparing for the future? KK: In all the knowledge accumulated on this planet, there have been profound insights on how to deal with great issues. When one studies the history of an event 50 years after it took place, the learned of the past, as well as those now, have perspectives on how situations should have been handled. We have the most accumulated knowledge base of all time at our fingertips by means of the internet. Imagine what knowledge could be gained if schools were established with a focus only on researching how the world can be saved from repeating horrible histories. But perhaps these schools already exist. There is one character in the book, Veryalda, who argues that the Order must be seen as progressive if they want their message to be heard. This is a sentiment that many modern religious congregations are faced with today. What is the significance of Veryalda’s voice and the Order’s fear of hearing her? KK: When I initially developed Veryalda's character, I was pretty much following the classical style of recognizing the need of a strong antagonist. But, like all people, she is three dimensional. None of us are all good or all bad. In the bigger picture, Veryalda represents all those whose views are not linked to any ancient beliefs held by religious institutions. I don't think the Order will ever see Veryalda as anything but as a heretic and evil. There is some doubt expressed both by Nora and later Tunde indicating that they, perhaps, are not on the right track. Generally speaking, the Order is steeped in the 'I believe' tradition, but they are open enough to be promoting a borderless faith. This is far more progressive than the divisive, diverse, religious institutions that exist in our communities. Only Aideen seems to recognize that perhaps Varyalda is not all dark and evil. And that is where I personally need to leave the reader. It could be argued that the Order, in silencing Veryalde and twisting her words, is guilty of the same silencing they are trying to correct. This leaves the reader with a sense of dis-ease. What are your thoughts? KK: That is precisely the sense that I hoped the reader would be left with! Initially, I think I was heading for the Order representing all goodness but as the writing evolved, I could not help but intersperse some ideas that imply something else. Of course you realize that now I can potentially be 'excommunicated' from all religious institutions, and equally from the humanist camps, depending on which perspective was perceived. The specifics of what the sisters have learned in seventy years, and their plans for the future of mankind, is never revealed. Why? KK: I guess that could be another book! You are correct. I didn't delve much into what the women have learned. I did give bits of knowledge through the key note Speakers during the symposium. The solution offered was to work hand in hand with confidence as equal partners with their male counterparts; the plan is to bring to the Outerworld an order rooted in communication and consensus-building among all areas that would be affected by any issue. Beyond that, I am an ordinary person, with no other answer to world harmony. Your own career with Health Canada must have exposed you to a number of marginalised person’s stories. How has that experience informed your writing and your perspective? KK: I worked with major national, community based, religious, academic etc. organizations, including women from all walks of life. What I learned from that experience is echoed throughout the novel, in various voices. Women have incredible stories to tell; they not only survive horrendous life circumstances but thrive and make a new world for themselves. I have seen it with my own mother, but through everything she experienced, including raising a baby as a single mom, she believed that God would take care of us. And in truth He did. My novel is a praise to women because we can accomplish great and wonderful things and affect immense change. And I'm not convinced we do it all alone. I do accept that within us there is a speck of something that we can only call mystical. Going beyond the end of THE WOMEN GATHER, what do you imagine they accomplished? What stories will Aideen will be telling her grandchildren? KK: First and foremost, I think their accomplishment was an understanding and an acceptance of their value, worth, confidence, strength, stamina, and inner subconscious spark. Using all these abilities, they in fact can make a difference; in harmony with one another, what they can accomplish is boundless. What will Aideen be telling her grandchildren? that she was there just before the Portal opened and that that changed everything. What do you hope readers will take from your book? KK: I hope that some of the messages resonate with the reader. I know that the world is filled with horror like the senseless tragedy of the Boston Marathon, but I would rather that the message of the book is to look for how we can harness the goodness. Thank you for giving me the opportunity to respond to these most thought provoking questions. All the best. Thank you for your time, Katalin. 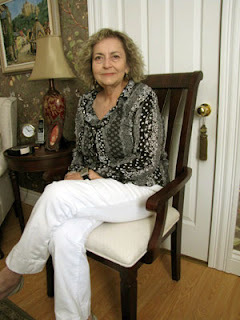 If you would like to learn more about Katalin Kennedy or her work, you can visit her at her website, katalinkennedy.com. About the Interviewer: Jessica Veter is a novelist raised in rural Ontario. Having escaped to Toronto, she spent the 90’s over-educating herself at York University and then the University of Toronto. Once she accepted that there were never going to be any job listings in The Globe and Mail headed “Medievalist Wanted”, Jessica went to Japan. There, she met her husband and they lived in England before returning to Canada with a son and a greyhound. Now in rural Flamborough, Jessica and her husband raise 3 boys, 6 chickens and are owned by 1 dog. You are welcome to visit her at www.jessicaveter.com. The Giveaway - Katalin is giving away three signed copies of her novel, The Women Gather. 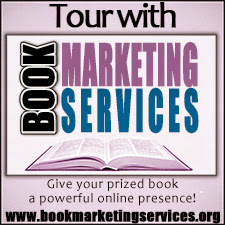 To enter, just sign up using the Rafflecopter widget below. 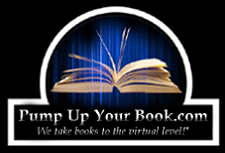 Hi Jessica, On behalf of Katalin Kennedy and Book Marketing Services, I would like to thank you for hosting and interviewing Katalin, author of The Women Gather, today on I Read A Book Once. Katalin will be by later in the day to respond to any questions and/or comments. To all readers, please take a moment to enter the giveaway to win an autographed copy of The Women Gather http://katalinkennedy.com/. Please join us tomorrow when Katalin will be in the author spotlight over at New Age Mama http://newagemama.blogspot.ca/. Each day of this tour brings the possibility that my novel "The Women Gather" will reach more people and perhaps more readers. I am ever so grateful to you Jessica for this interview which had me delving deep into the heart of the message I wanted to convey. Thank you again.